Build Ohio celebrates commercial construction in Ohio with an annual building awards competition and Build Ohio Celebration in November. Winning projects receive the custom-made bronze and green marble Build Ohio Statue. The competition is open to all AGC of Ohio contractor members in good standing. The Associated General Contractors of Ohio represents a membership of general contractors, subcontractors/specialty contractors and service providers. The Guide is the AGC of Ohio go-to industry resource for finding general contractors, specialty contractors, suppliers and affiates. The Associated General Contractors of Ohio is a commercial construction trade association governed and directed by building contractors. It is a full service AGC Chapter chartered by the Associated General Contractors of America, the oldest and largest national commercial construction trade association in the United States. The association has grown from a loose confederation of regional chapters into a prominent statewide association with seven divisions, boasting a membership of numerous general contractors, specialty contractors, suppliers and service providers to the construction industry. 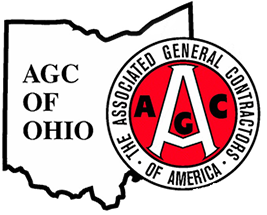 Since its establishment in 1970, AGC of Ohio has played a prominent role for commercial contractors. AGC of Ohio and its members strive to improve the industry by promoting fair practices, working with public and private owners to stimulate construction markets, and providing education services—all while upholding the core AGC principles of skill, responsibility and integrity. By offering a common voice for the industry, the opportunity to interact with peers and a vehicle for legislative and regulatory change, AGC of Ohio serves contractors and helps them collectively improve the commercial construction industry in Ohio. AGC OF OHIO Provides services to and advocates on behalf of commercial builders to improve the quality of construction and protect the public interest. AGC of Ohio has a comprehensive governmental affairs program coordinated through the AGC of Ohio Board of Directors and the committee structure. AGC of Ohio lobbies and educates the state legislature and other elected officials about business and construction-related issues, either alone or in conjunction with other interested parties, and works with state agencies on issues of concern to AGC of Ohio members. Four major annual events bring a large number of contractors from all over Ohio together. AGC of Ohio’s annual convention, which usually takes place in a warm, exotic locale; the Build Ohio Celebration that honors the accomplishments of the commercial construction industry and recognizes excellence in construction; a Safety Luncheon that honors companies’ safety achievements; and a golf outing that benefits the AGC of Ohio Scholarship Fund. This is the AGC of Ohio supported and promoted, go-to industry resource to find contractors, suppliers and affiliated service providers in Ohio. AGC of Ohio Online Buyers Guide is easily accessible for construction professionals across Ohio and simple to use. You will see a button located on the AGC of Ohio "Find A Contractor" that will bring you directly to the Guide. Efforts through AGC and in conjunction with AGC Divisions and industry partners are focused on the goal to attract, retain and train the future construction industry workforce.